The Dell Inspiron laptops are one of the earlier notebooks that made the mark for Dell in the past 6 years and since then Dell has been able to come up with fantastic durable and sleek laptops. In this tutorial I will show you how to dismantle and replace a cracked/broken or flickering LCD screen panel of Dell Inspiron 1501, 1520, 1521, 1525, 6000, 6400 and 1300 laptops. I will also show you how the backlight of the laptops plays an important role to the display monitor and it can be changed if if the screen backlight has gone. I would like to go straight to showing you the replacement instruction but before that I will like to outline what problems you could face with Dell Inspiron 1501, 1520, 1521, 1525, 6000, 6400 and 1300 laptops and where to get the right screen. 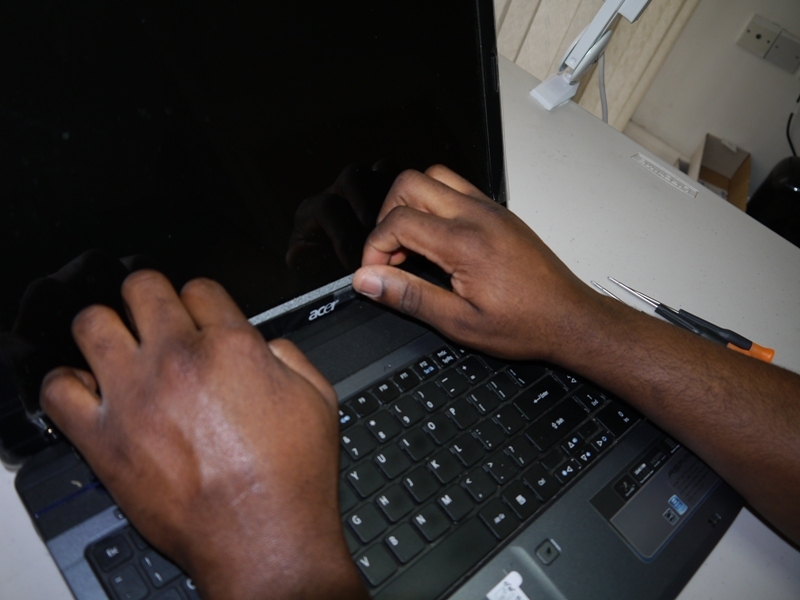 Dell screen has gone dark or black: This can be solved by changing the screen inverter. Use the tutorial guide here as a guide. Before starting the repair remove the Dell laptop battery. With a flat screwdriver remove the 4 to 6 screw covers made of rubber or plastic depending on the model you have. Doing this will expose the screws holding the screen technology. The next thing to do is to remove the screws from the screen plastic bezel. Keep these screws aside as they will be different from the rest in this screen repair. Put your fingers between the screen and the bezel as shown in the image and start pulling on all sides until you remove the bezel. Do this with care to avoid snapping it. Pull the Dell screen carefully towards you and remove all the sidescrews. If you are unable to reach the side-screws at the bottom try unscrewing slightly, the screw at the bottom of the screen. Place the broken screen face-down on the laptop keyboard area and now you will see the screen display cable, the inverter attached and the screen part number. Display Cable: When this is faulty you may get lines and flickering of the screen. Screen Inverter: If this is faulty the screen will be black while you can still make out the windows when shining a torch or looking properly. I will explain this properly. All 15.4 inch TFT WXGA laptop screens for most brands are generic and same. But for the Dell it is very unique and a screen with Dell Part Number must be replaced with the broken one. Additionally, there are also screen manufacturers part number which will look like the ones below. It is best to ask the laptop screen retailer before ordering the screen. The next job will be to remove the screen display cable connection to the screen. The connection is always held in place with a tape. Peel up the tape and diconnect. Some of the cable may not come with a tabe but will come with a clip/holder. You will have to press down on the two sides of the clip to disconnect the cable. At the bottom of the screen the inverter is attached firmly. Remove the cable connection to the inverter. Doing the above you will have completely removed the defective or broken LCD screen from the Dell laptop. The backlight wire to the inverter is closed up together with a white tape. To start the process of the inverter replacement remove the white tape to expose the wires and the screw pinning down the inverter to the screen. Remove the backlight wire connector from the inverter by puling. Use the image as a guide. Unscrew the screws holding the inverter to the LCD screen and keep it safe. If the screen is LG Philips it will come with a pinning mechanic. To remove the backlight inverter from the LG philips use a flat screwdriver. Put the screwdriver between the inverter and the screen and start wiggling. Wiggle only at the point where the pinners are. At this point you will have successfully removed the screen inverter. To install a new one the same way it is removed. Laptops are great for using in schools and other educational establishments because of their portability. They are particularly fantastic for using in one-to-one classes with children with special needs, as the interactivity stimulates the brain, and most children enjoy using the computer. Unfortunately, when a laptop is not your own it is often the case that it is treated with less care and the sad fact is that they often get broken. The good news is that it is often the screen which gets broken, and this is usually very easily replaceable. Laptop Screens Online supply Acer laptop screens and Toshiba laptop screens, as well as a large selection of other brands. With over 5,800 laptop screens in stock and an easy search facility by either laptop make or screen product number, you can be sure to find exactly what you need. If by any chance they don’t have what you require in stock, a quick call should be able to resolve this quickly. All of Laptop Screen Online’s products are the genuine article and are brand new, not refurbished. So if you order replacement Acer laptop screens, that is what you will receive! For education and government establishments, there is a handy pdf order form on the home page to complete and VAT receipts are supplied with all orders. Every item that is ordered before 4pm Monday to Friday will be delivered the next working day (to the UK), and for outside the UK, delivery normally takes around 3-4 working days. If by any chance you are not happy or have order the wrong type of Toshiba laptop screen or other laptop screen, you can return the item within 7 days. What’s more, when returning an item there is no restocking fee, like many of their competitors. Laptops are wonderful things, but unfortunately due to their transportable nature, they are more prone to receiving knocks and bumps than a sturdy desktop PC. The most common part of a laptop to break is the screen. Think about it, how often do you pile stuff up on top of your closed laptop? All that extra weight can cause the screen to crack. Likewise, when transporting your laptop, dropping it or knocking against something might break your screen. All is not lost, however. A broken screen rarely affects the functionality of your laptop, but just needs replacing with a shiny new one. Laptop Screen Online supply genuine original Dell replacement screens, as well as replacements for Acer and Toshiba laptops, and other netbook screens. It is easy to find exactly what you need by using their search facility, and you can even pay by PayPal as well as debit or credit card. Most people can’t afford to be without their laptop for more than a couple of days, or even less if you need it for business. Consequently, their netbook screens can even be delivered next day in some cases and come with full instructions on how to fit the screen yourself. If you are still struggling to fit your Dell replacement screens or other models, then Laptop Screen Online have their own YouTube channel with videos demonstrating just how to do it. You no longer need to suffer with an unsightly crack across your screen, or a distorted image. Laptop Screen Online also offers a fantastic international delivery service to anywhere in the world, which even allows you to pay in a variety of different currencies, including US Dollars and Euros. If you can’t find exactly what you are looking for, you can also call to check whether they have your specific model. Unfortunately, laptop screens don’t last forever. And sometimes your laptop will continue to work for years to come if you simply replace your laptop LCD screen. So, how can you avoid having to but a completely new laptop? Thankfully now you can replace a IBM Lenovo G550, G555, G560, G565, G570, G575, B550 or Ideapad Z570 HD LED laptop screen inexpensively. The below instruction can be used if your IBM laptop screen is cracked, broken, twitching, flickering, showing black/dark/blank or with bleed and lines. This tutorial can help in replacing damaged laptop screens on other laptop brands as well. Remove the IBM laptop battery before starting the screen repair. The IBM notebook has eight plastic or rubber screw covers on the front of the laptop display monitor. Use a flat object to remove all the covers to expose the screws underneath. Remove all the screws from the front plastic and keep them aside. Place your fingers between the IBM laptop LCD screen and start pulling on all sides until the bezel comes off. After removing the bezel pull the screen towards you and remove the side screws from the metal brackets holding it. Placing the screen facedown will reveal the screen cable and part number on the sticker at the back of the display panel. The part number for the screen can range from LTN156AT05, LTN156AT09 or LTN156AT15 made by Samsung, LP156WH4 or LP156WH2 made by LG Philips, B156XW02 made by AU Optronics, ChiMei Innolux screen N156BGE-L21. It will not matter the one supplied by the seller as all the mentioned 15.6 LED TFT screens work interchangeably and compatible. To remove the display cable first peel of the cleartape holding it down before disconnecting. Doing all the of above will help you only to remove the IBM Lenovo G550, G555, G560, G565, G570, G575, B550 or Ideapad Z570 screen. Install a new screen simply by continuing the same way but this time in reverse. If you’re looking for a IBM laptop screen, you can get replacement screens for IBM Lenovo G550, Ideapad Z570, IBM Lenovo G560 and G565, G570, G575, B550 15.6 LED screen. Besides IBM laptop screens. To find the laptop screen that you need, select the model of your laptop from the list on Laptop Screen Online. You can usually find the model number on the bottom of your laptop, or sometimes also on a sticker that is placed on top of your laptop, near the keyboard. Once you have found the product you need, you can select the currency type you want to view the price: British pounds, Euros, or American dollars. You will also be told whether the item is in stock or not. You can pay online safely using Visa, Mastercard, Paypal, or even Google Checkout. Fitting a new screen to replace the broken, flickering/twitching on of Acer Aspire 7540, 7540G, 7551, 7551G, 7738G, 7741G or 7741Z as many do not know, is quite easier than thought. Because the AS7540, AS7540G, AS7551, AS7551G, AS7738G, AS7741G and AS7741Z series laptop come with 17.3 inch Cinecrystal LED widescreen it is likely to break easier than any other laptop because of its size. 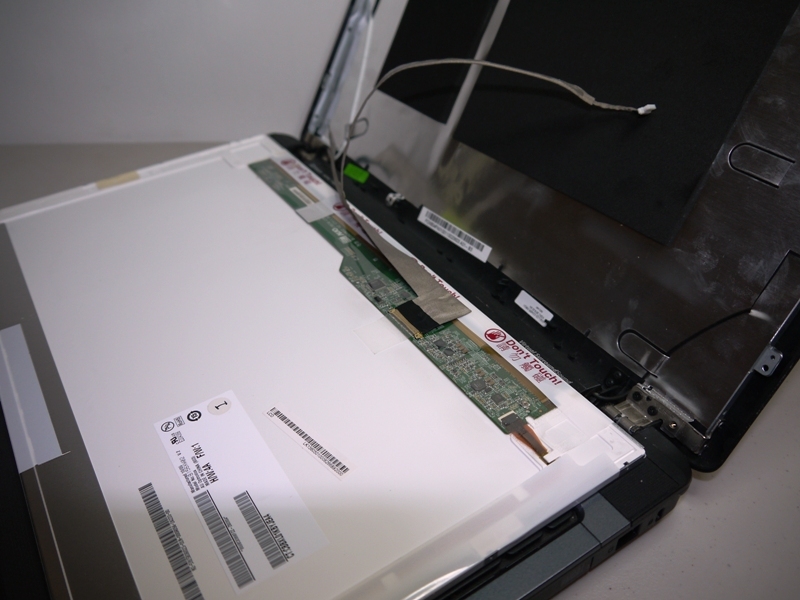 In this tutorial I will show you how to dismantle a cracked/broken, damaged or flickering 17.3 inch LCD screen of the Acer Aspire laptop series. 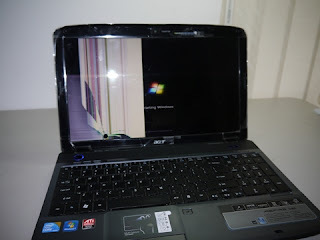 Always have the new screen with you before starting the laptop screen repair for a quick swap with the defective one. Always remove the laptop battery before starting any repair on a laptop. Use a flat screwdriver to remove the 7540, 7540G, 7551, 7551G, 7738G, 7741G or 7741Z screen plastic or rubber covers. Underneath these covers you will find the screws holding the bezel to the back-cover. Place your fingers in the space line between the screen and the plastic bezel and start pulling firmly on all the sides. The bezel is very fragile and easy to snap so you must do this with care. You must not pull too hard. Use the image below to pull the screen slightly towards you slightly and start removing the side screws from the brackets. The brackets, joined at the hinges area and on the both sides of the laptop act as holders to the laptop screen. By placing the screen face-down on the keyboard area you will be able to see the back of the screen and the cable connection. As a 17.3 HD LED LCD Cinecrystal screen the Acer Aspire 7540, 7540G, 7551, 7551G, 7738G, 7741G and 7741Z notebooks come with only one connection at the back of the monitor panel. This cable when defective may cause the screen to go black, black or dark and may also cause the distortion of the images displayed. Most of the time lines-on-screen is seen to be the usual effects when the display cable is defective. The screen part number on the sticker can range from LP173WD1-TL A1 or A2 made by LG, LTN173KT01 made by Samsung, B173RW01 V.0, V.1 or V.2, N173O6-L02 REV C1 Chi Mei make and last but not least Chughwa CLAA173UA01A. The above screens are very much compatible and interchangeable so it will not matter the manufacturer model you have acquired from the laptop screen retailer. Carefully pull up the clear tape holding down the display cable and pull the data connectors apart. This must be done with care as any mistake may cause a permanent damage to the cable or the connector and this is unrepairable. The Acer Aspire 7540, 7540G, 7551, 7551G, 7738G, 7741G or 7741Z screen removal process is complete. To replace it with a new one you only need to carry out the instruction in a reverse. Sometimes when a laptop display stops working, you may be tempted to try and keep using your laptop-especially if only a small area of the screen is affected. You may also be tempted to see if there is any way you can fix the screen yourself. There is no real fix for a broken laptop screen. The only way to get your laptop working properly again is to replace the broken screen. But if you don’t know where to look, sometimes replacing your laptop display can be expensive. But at Laptop Screen Online, offered are some of the most competitively affordable prices available on all different brands of laptop screens. At Laptop Screen Online the already low prices also reflect the VAT charged, so there are no hidden costs or additional fees. The price you seen the price to pay. Need replacement Dell laptop screens? Laptop Screen Online can help, even if you need a Dell laptop LCD screen. Or perhaps your shiny new Sony or snazzy new Toshiba has been damaged by a careless child or naughty pet and you need to replace the screen on one of these brands? Never fear, Laptop Screen Online can offer replacements for many different models on dozens of different brands. You’ll also find that items are in stock wherever possible so that even if you’re in a hurry you will get your replacement screen as soon as possible. So, if your laptop screen is starting to go, remember Laptop Screen Online for a quality, inexpensive replacement. Sadly, many of us have been there. Even when you try to be extra careful with a laptop, sometimes fate seems to be against you. Even the most careful people sometimes drop their laptops. One of the most common problems after dropping a laptop is having the screen stop working. So, what do you do if your Acer Aspire Timeline X 4810T, 4810TZ, 4810TG, 4820T, 4820TZ or 4820TG laptop screen is broken but everything else still seems to be working okay? Can you replace a laptop screen? How much will it cost? You’ve come to the right place to find the answers to these questions. So if that Acer Aspire Timeline X 4810T, 4810TZ, 4810TG, 4820T, 4820TZ or 4820TG screen is flickering, has lines or has gone black or dark. Use the instruction here to fit a new one. 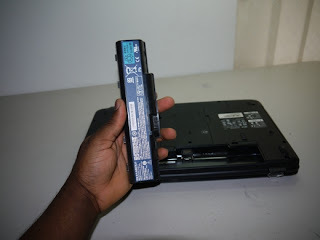 First remove the Acer laptop battery as laptops with LED screens are very sensitive to charges when carrying out repairs on them. Take the screw covers off which will then expose the screws holding down the bezel to the top part of the netbook. Remove the screws too and keep them safe. These screws are very important as they hold the screen area together. Place your fingers between the bezel and the laptop screen and start pulling slightly on all the sides until the bezel is pulled free from the laptop. The Acer Aspire One bezel is very fragile and easy to snap so you must do this with care. You must not pull too. Now the plastic bezel is out the next thing is to remove all the side screws as shown in the image below. Make sure all the screws are well places so as not to have them mixed up. Place the Acer screen face-down on the keyboard area and at this point you will be able to see the screen display cable and the screen part number. The Acer Aspire Timeline X 4810T, 4810TZ, 4810TG, 4820T, 4820TZ and 4820TG series come with part numbers LG Philips LP140WH2-TL A1, A2, AU Optronics B140XW02 V.1 and Samsung make LTN140AT02 and others. Use the image instruction below, carefully pull up the clear tape holding down the screen data cable and pull the data connectors apart. This must be done with care as any mistake may cause a permanent damage to the cable or the connector. Congratulations! Because after this then the Acer Aspire 4810T, 4810TZ, 4810TG, 4820T, 4820TZ or 4820TG screen removal process is complete. To replace the screen you only need to carry out the instruction in a reverse order. Whatever laptop you have, chances are we probably have a replacement screen for you. We carry many different brand names including top names like Sony, Toshiba, Apple, HP, Packard Bell, and many more. 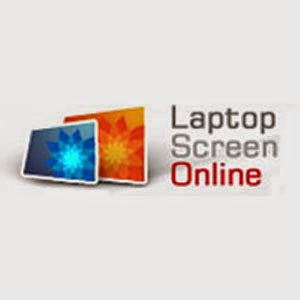 Here at Laptop Screen Online we sell replacement laptop screens for those broken screens or malfunctioning screens. Do you need a new Acer laptop screen? Or perhaps you are in the market for a Dell Inspiron laptop screen? We also offer competitively low prices so that you don’t have to break the bank in order to replace your broken laptop. We want only the best for you and your laptop, which is why the price you see on screen is always the price you will pay—no hidden fees or extra costs. If you make a mistake in your order, or something isn’t quite right when the screen arrives, you can also have your purchase refunded or replaced. So, now that you know your laptop screen and how it can be replaced, what are you waiting for? Whether you need a Acer replacement screen or Dell screen, we have the product for you. Remove the Hp Pavilion Dv2000 series laptop battery before starting the repair. Remove rubber covers to expose screws in the plastic bezel. Use a precision screwdriver to remove all the screws in the screen front. Keep the screws aside safely. Put a flat piece or screwdriver between the bezel and backcover to start the job of removing the front bezel. Remove the plastic beze carefully from the front. The HP Pavilion HP pavilion DV2000, DV2500, DV2510, DV2700 and DV2900 series bezels are very fragile and can snap if not removed with care. Pull the screen towards you slightly and remove all the sidescrews. Place the screen down on the keyboard area and at this point the connectors to the back of the screen and the display cable will be visible. This is the cable that carries the data from the motherboard to the LCD screen. Carefully pull the screen cable away from you to disconnect it from the 30 pin port. Some of the connection may be held down with a clear tape. Peel off the tape before doing the diconnection. Disconnect the screen backlight wires from the inverter. The inverter provides brightness to the screen. If your laptop screen has gone dark, black or blank this piece of electronic will be responsible and will need changing to restore the backlight of the LCD Screen. The screen dismantle and removal process is complete. Install a new screen in the same way but this time in reverse procedure.